That >>> is called a prompt, which means it’s something the computer displays to tell you it’s ready for your instructions. You can type things into that window, and the computer will obey them when it understands your commands. >>> Tell me the sum of twelve and thirteen. It won’t understand it at all. Instead, because the computer doesn’t speak our language, you have to talk to it in a special language that is designed to be easy for the computer — and hopefully you — to understand. In fact, there are lots of languages designed for computers and humans to communicate with each other. The one you’re going to learn is called Python. One of the good things about Python is that it’s pretty easy for humans to understand too. Here’s how you ask the computer to tell you the sum of twelve and thirteen. Try it yourself. You don’t need to type in the >>>, but you do need to hit the key marked Enter after typing the line. Here are some more examples, with the computer’s answers shown too. >>> 1 + 2 * 3 - 4        # Use * for multiplication, not x. 3                        # If you expected 5, think again! >>> 12 / 4               # Use / for division. Try experimenting some more with using Python as a calculator. Maybe try having it do some more complicated things — experiment with more numbers and bigger numbers. Does it slow down at all? Or hesitate? Or is it pretty fast? Here, Python has calculated (1 + 2) and (3 + 4) — getting 3 and 7, and then multiplied the results together. Don’t be afraid to experiment. Whenever you learn something new that you can do with Python, try making slight changes — or bigger changes — and play around until you’re confident that you understand just what’s going on. Don’t limit yourself to what’s actually printed on the sheets! Incidentally, if you’re still confused about the fact that 1 + 2 * 3 - 4 gives 3 and not 5, the reason is that multiplication happens before addition. Your math teacher probably calls this BODMAS, PEMDADS, or something similar. If you’re still confused, try asking your math teacher to explain it to you. What did you think the computer would do? What did it do? You’ll notice that this time we haven’t told you what the machine says. That’s because you’re supposed to try it for yourself. You won’t learn anything if you don’t try the examples. Write down in your notes what the machine said when you asked it for 3 * 'hello', so that you remember. Why would you care about that? Well, suppose you wanted a string containing the text I'm sorry? Try it. Again, we haven’t told you what Python says to that last thing. Write it down in your notes. This might get very boring after a while. And if anyone else wanted to read what you were doing, they might be confused by the mysterious number 123456 and wonder why it appeared so often. You can solve either of these problems by giving the number a name. To save typing, give it a short name, like n — short for number, maybe. To make it more obvious what it means, give it a longer name, like salary. Here’s how you do that. The idea is that, after you’ve said salary = 123456, you can always type salary instead of 123456. This is because the symbol = means is assigned to , not is equal to like you were tought in math class. So now 123456 is assigned to the word salary. What we’ve called names, most people call variables. You’ll find out later why they’re called that. For now, names is fine. So far, you’ve done very little that your pocket calculator couldn’t do equally well. Here’s something your calculator probably isn’t so good at. The extra spaces on the second line are important, by the way! This is explained in more detail in Sheet 2 (Turning the Tables). ...     print(x, x * x)  # The prompt changes - Python is expecting more. ...                      # Just press Enter. Can you guess what this will do? … If you guessed that it prints out the numbers from 1 to 5 along with their squares, well done. Notice that Python conveniently puts a space between the two things you’ve asked it to print. The print command is used when you want to make the computer display things. The reason you haven’t needed it before is that when you type it something that has an answer Python can work out, it automatically displays that answer. Things with answers are called expressions, for some reason. But Python doesn’t print out every value it computes; only the values of expressions you type in at the >>> prompt, and things you tell it to print out using the print command. At some point when you’re using Python, something like this is going to happen. This looks pretty scary. Don’t be scared. It’s just Python’s way of saying you did something it didn’t understand. You can probably ignore everything except the last line. The last line is Python’s way of telling us that it doesn’t know how to add a number to a string. 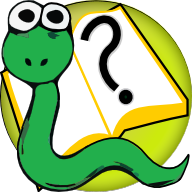 If you would like to dig deeper Python’s into error messages, have a look at Sheet E (Errors), which has a list of common complaints Python might make at you and explanations of what they might mean. Putting things inside str(...) converts them into strings. So far you have only been using the Python shell, the thing that gives you the prompt and waits for you instructions. We will keep using the shell whenever we want to demonstrate new things Python can do. Once we want to do a lot of things or to do the same thing over and over, the shell is not so good. For one thing, it forgets what you typed after you quit it. And if you make a mistake when typing something long, you have to start all over again. When we want to write programs, we will put them in a text file using a text editor. Your teacher will show you which editor to use and how to use it. The important thing to remember is to give your file a name that ends with .py so that your computer will know it is a Python script. "How come this did not print?" Run the program and look carefully at its output. What happens when you put an expression on a line without a print command in a Python script? Does it print? What does putting a comma at the end of a print command do? What does putting a print command on a line by itself do? Write down what you learned about printing. You will use this information often in the sheets ahead. You can use Python for drawing pictures. Try this in a script. The first two lines will probably seem rather weird; we’ll explain them later. There are two kinds of worksheets for you to experiment with. Activity sheets, each of which takes you through writing a program to do something that might be interesting. These sheets are numbered: Sheet 2 (Turning the Tables), Sheet 3 (Pretty Pictures) and so on — the sheet you’ve almost finished reading now is Sheet 1. Information sheets, each of which tells you something useful about Python. These sheets are lettered: Sheet D (Dictionaries), Sheet L (Loops), or whatever. Usually the letters have something to do with what the sheets are about, but that hasn’t always been possible. It’s generally a good idea for you to work through the activity sheets in order. Each one will point you to a few information sheets that you’ll want to have handy when working through it. The next one is Sheet 2 (Turning the Tables). © Copyright 2019. Created using Sphinx 1.6.7.